More than 11,000 people from across Kitchener participated in the 123 gatherings registered with Festival of Neighbourhoods. Registered neighbourhood gatherings ranged in size from four to 1000 participants. The winners of two $20,000 capital grants provided by the City of Kitchener were Cherry Park and Queen’s Park neighbourhoods. The grants, which are awarded annually, enable residents to plan and execute meaningful improvements in their neighbourhood. The Neighbourhood Connections Award, sponsored by the Social Development Centre Waterloo Region, has become the Trudy Beaulne Award, in honour of one of the Festival of Neighbourhoods founders. The award was presented to the Victoria Park neighbourhood in order to provide time for more engagement and community development activities to strengthen the social connections in this neighbourhood. The Independent Living Centre of Waterloo Region helped recognize gatherings for being inclusive and welcoming to residents in their neighbourhood. Those recognized included the New Doon neighbourhood BBQ, Schneider Creek neighbourhood annual potluck, and Auditorium neighbourhood New Year’s skating party. Doon South neighbourhood was also recognized for their “Backyard Sessions” series of inclusive gatherings, which included a forest therapy hike, and sessions on traditional Indian yoga, home maintenance, as well as other activities. This year’s Ward Challenge winner was Ward 4, with 26 registered neighbourhood gatherings. The amazing 2018 Celebration Sponsors: Boehmers Hargest Block, Steed and Evans, Victoria Park Neighbourhood Association, Alejandra Ivic Re/Max Twin City Realty Inc., Grand Valley Society of Architects, Strassburger, Mumbly Insurance, Swanson's Home Hardware Building Centre, Freure Homes, Waterloo Regional Police Service, Independent Living Centre of Waterloo Region, & ASCEND (KidZone sponsor). 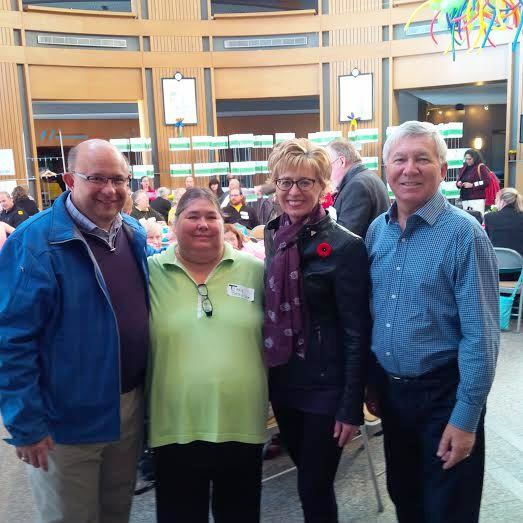 We had a wonderful 24th Annual Celebration at Kitchener City Hall on Sunday, November 19th 2017. We gave away prestigious awards and two $20,000 neighbourhood improvement grants. Neighbours reached out, connected and shared stories. More than 17,000 people from across Kitchener participated in the 130 gatherings registered with Festival of Neighbourhoods. Neighbourhood gatherings ranged in size from four to 1,000 participants. We had 49 neighbourhoods registered and hope the number will grow in the year ahead under the REACH! theme. After five years in a row of Ward 10 having the most registered gatherings, this year the Ward Challenge was taken by Ward 9 (Councillor Frank Etherington) with 31 gatherings. The Paulander neighbourhood received the Arts and Culture award, sponsored by Alejandra Ivic, RE/MAX Twin City Realty Inc., for registering their annual community BBQ, where residents enjoyed a mobile gallery, collaborative art project, henna and face painting. This year, Laurentian West neighbourhood Wetlands Cleanup, which was organized by students in grades five and six received the Youth Award. This award is sponsored by Waterloo Regional Police Service. The Safer Neighbourhoods Award, which is sponsored by Swanson’s Home Hardware Building Centre, was presented to the New Doon neighbourhood, who registered their BBQ. The Green Neighbourhood Award, sponsored by Boehmers Hargest Block Ltd., was presented to the Mill -Courtland neighbourhood. The Heritage Award selection, sponsored by Grand Valley Society of Architects, was the Victoria Park neighbourhood, who registered a pizza party and trivia night, which featured neighbourhood-specific questions researched and presented by local neighbourhood historians. The Traynor-Vanier neighbourhood was selected by the Independent Living Centre of Waterloo Region for the Inclusion Award. The Neighbourhood Connections award, sponsored by the Social Development Centre Waterloo Region, was presented to the King East neighbourhood in order to provide more time for more engagement and community development activities to strengthen the social connections in this neighbourhood. Opening remarks by John MacDonald. The final step in the registration with the Festival of Neighbourhoods is to send at least one representative of your neighbourhood to the Festival Finale Celebration! You are encouraged to bring as many people from your neighbourhood as you would like—everyone is welcome! At the Finale, you will join many community members and neighbourhood champions from the city who helped organize activities and gatherings to bring their neighbours together. Join in the celebration, inspire and be inspired by others. •Special activities at during Sign In this year with the Interactive Felting Session and Puppet Zoo with Sarah Granskou and Tannery School of Music! •Stories and Conversations - scrapbooking and Festival of Neighbourhoods FUN Bingo! • KidZone – children’s activities during the Finale with a special workshop from the Green Light Arts Theatre! Festival of Neighbourhoods welcomes all the Ward Councillors, the Neighbourhood Strategy Team and all our award sponsors in celebrating one extraordinary year as we build the future of Kitchener's neighbourhoods together. The grand prize draw winner of the $10,000 Capital Improvement Grant was awarded to Edgewater Estates and $20,000 Grant went to Hohner Avenue! Congratulations! The Pillar Award (a neighbourhood that has registered an event for five or more years) - Forest Heights neighbourhood, a long time community beehave for old and young! The Newcomer Award (first-time registered activity) goes to Prosperity that registered their first activity Easter Egg Hunt and started as a neighbourhood blitz with the FON team! The Arts and Culture Award - King East for a creative transplanting of Porch View Dances inspiring music and dance in public places and private porches around the neighbourhood. The Green Award - Forest Heights Neighbourhood for a series of activities to improve the edible forest and pollinator fedges alongside the trails in the neighbourhood. The Youth Award - Traynor-Vanier, for the Pre-Halloween Party organized by young tenants. The Heritage Award - Lower Doon, for a creative and neighbourly Drop-in Map activity to learn about historical timeline and landmarks in the neighbourhood. The Safer Neighbourhoods Award - Victoria Park Neighbourhood Association for their Pumpkin Parade. The Inclusion Award - Laurentian West, for their Community FUN Fair organized by the W.T. Townshend Parent Council and engaging the whole community around the school. The Neighbourhood Connections award - Cherry Park neighbourhood for the second year in order to deepen community engagement efforts in the neighbourhood. Ward Challenge Award went to Ward 10 fifth year in a row, for planning, hosting and registering 38 neighbourhood events. Festival of Neighbourhoods is fortunate to have the loyal support and sponsors year after year, all those businesses and organizations that believe we can do more for our neighbours. City of Kitchener - $20,000 and $10,000 Capital Grants! Date: Sunday October 18, 2015 from 1-3pm. 39 neighbourhoods came together to celebrate strong and thriving neighbourhoods at the 22nd annual Festival of Neighbourhoods (FON) award ceremony this past weekend. We collectively brainstormed what would be cool winter activities and how to keep neighbours involved for the long term - hope you find this collection of answers useful! Over 1300 community members took the leadership in helping to organize162 registered Festival of Neighbourhoods events, attended by more than 25,500 people in the 2014/15 season. The grand prize draw winner of the $21,000 Capital Improvement Grant was awarded to Ward Six neighbourhoods who came together to organize an annual Ward Six movie night. The Arts and Culture Award - The Central Frederick neighbourhood, for their Fairy Walk project, annual porch party event and for adding music to their local park through their Piano in the Park project. The Green Award - Mansion Greens Community and Edible Forest project - they planted fruit trees and shrubs to create an edible landscape open for anyone in the community to enjoy, along with perennial vegetables and ground covers to assist with natural insect control. The Youth Award - Laurentian West, for the Annual Laurentian Wetlands Clean-up. The event was organized by grade 5 and 6 students who also participated to provide help on the day of the clean up. The Heritage Award - Victoria Park Neighbourhood, for a lecture in the park in which a long-time neighbourhood resident, Harold Russell spoke about his experience growing up in Victoria Park during World War Two and reflected on the changes of the neighbourhood from then to now. The Safer Neighbourhoods Award - Stanley Park Neighbourhood for their Bike Safety event. The Inclusion Award - Tanglewood Neighbourhood, for their neighbourhood street party. The organizers were sure to include everyone by bringing food to immobile neighbours, and sat with them to eat and to watch the fireworks. The Neighbourhood Connections award - Cherry Park neighbourhood, for their engagement and community development activities to strengthen the social connections in this neighbourhood. And finally, the Ward Challenge Award went to Ward 10, for planning, hosting and registering 32 neighbourhood events. We look forward to building even stronger connections with this year's sponsors! Festival of Neighbourhoods is fortunate to have not only the financial support of the following local businesses and organizations, but also their support in promoting the festival throughout the year. Their participation is a true indication of their commitment to the quality of life in our community and the value of the effort and contribution of the leaders who organize their neighbourhood gatherings. 21 Years of Celebrating Neighbours! 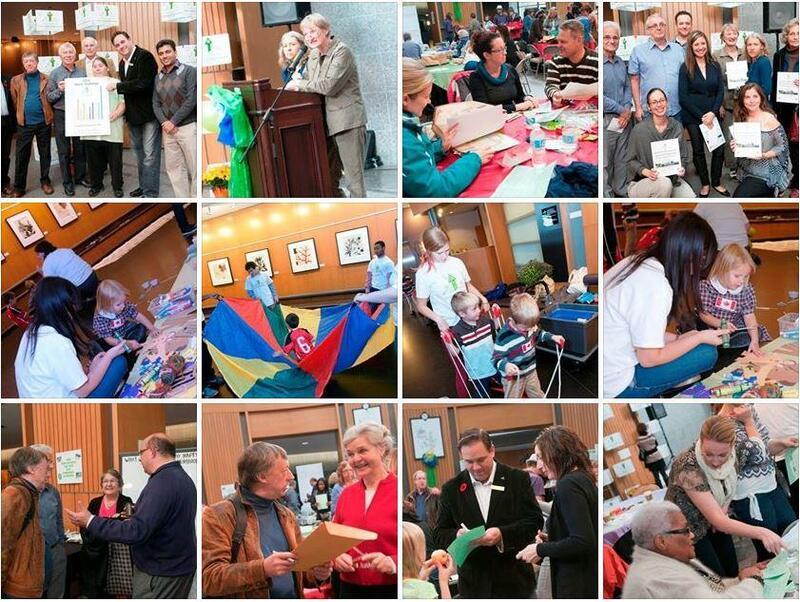 21st Festival of Neighbourhoods Finale brought 35 neighbourhoods together on November 2nd, 2014, 1-3 pm at the Kitchener City Hall Rotunda! We celebrated the record number of registrations again this year - 141 registered activities from 56 Kitchener Neighbourhoods! Take a look at the 2013/2014 FON Map and count the stars! Take a look then at the media release to see the description of the awards presented at the Finale.The $21 000 Capital Investment Grant is going to the Brock Street Neighbourhood and the Social Development Centre Waterloo Region is awarding Traynor-Vanier for the 2nd year to have enough time to support resident engagement and improve the social conditions in the neighbourhood! Ward 10 won the Challenge for the fourth year in a row with a record high number of activities. We thank all our champions and sponsors, and particularly our first program sponsor Julia White - The Cooperators Insurance. Both Carl Zehr and Berry Vrbanovic share the passion for neighbourhoods and we are only so grateful for the support from the Mayor's office, the City Council and the staff that we can continue to rely on. See more photos and congratulations on our Facebook and Twitter pages! All our volunteers did the wonderful job of co-hosting a historic celebration and helped in making all our award winners shine. The Festival received an award itself from Catherine Fife, MPP of Kitchener-Waterloo! All the awards, except the $10,000 grant, were selected this year by the Steering Committee or the Award Sponsors based on the merit and award criteria. If you want to learn more about this years activities go to the FON 2012/2013 Map and see some quotes from the neighbours! To see the photographs from the finale, go to our Facebook photo stream! On the Festival of Neighoburhoods blog page, you can also read about the community conversations hosted in Kitchener front yards and parks in 2013 as a part of 1000 conversations initiative led by Tamarack - An Institute for Community Development!